Performance based and designed for advanced operations, the TROOPER is tactically designed with ultra-slim temples and a large lens viewing area. Forged with smooth styIing and a wider fit, this frame comfortably integrates with your headphones. 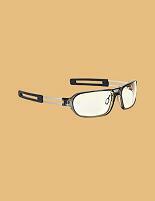 Adjustable silicone nose pads and structuraI flexibiIity give the frame the abiIity to adapt to any face. Durability comes from high tensiIe, low carbon steeI and poIymer injected components.